No, I'm not talking about Fifty Shades of . . . I'm talking about being able to see various points of view. Being open to understanding different sides. Perhaps even being confused (a lot) over what is the "right" answer, or even if there is always a "right" answer. There are very few things I see in black and white. The basics of my Christian faith. My pro-life stance. Kindness. Moral integrity. The importance of Beauty and Truth and Goodness. But there are so many things that are not so clear-cut to me. There's all the questions and confusion around taking care of my health. So much controversy over some of these things; so many people with very strong opinions about them. Sometimes I wish I was as sure of myself as those who think they have all the answers. It would be a lot easier. Traditional versus natural approaches to health? So I get a mammogram, but kind of stretch them out, and wonder if I'm doing the right thing. I just recently (the past three years) starting getting a flu shot, although some of my friends think that's tantamount to poisoning myself. I have the same doubts about taking the statins that have been prescribed to me. This past year I've taken them for a few months, then listened to friends who told me they were awful, stopped taking them, then starting taking them again. Argh . . . I feel so wishy-washy, but the truth is I just don't know what the truth is here. I do the best I can with the information I have. And then there's all the confusion on the political scene. People are lining up on the extremes on either side. Social media upsets me; people on Facebook have been vicious. I have lost sleep worrying about the divisions I see, people who I love taking polar opposite opinions, dissing and mocking each other. I wish sometimes I were more opinionated. Could see things in black and white. It would make things a lot easier. But instead I feel pulled first this way, then the other way as I read and listen to all the debate. But maybe it's the black and white people who need to slow down a bit. I like to think of myself as a thoughtful person who can consider both sides of a debate and try to understand another's opinion. I think many of the issues we face -- immigration, for example -- are complicated. It distresses me no end to see the ugly rhetoric from both sides, the fear and anger, and the name-calling. Can we be kind and reasoned and fair? Can we listen to each other? Can we come up with a balanced approach? There aren't quick and easy answers for many of the things in life. The problem is is that it's just so much work to look at all sides and fairly consider an issue. And maybe we'd never get anything done. It is true that at some point decisions have to be made, based on the best intel at the time. They will rarely be perfect solutions. Not everyone will be happy. Anyway, right now I do the best I can. I'm taking statins (for now). 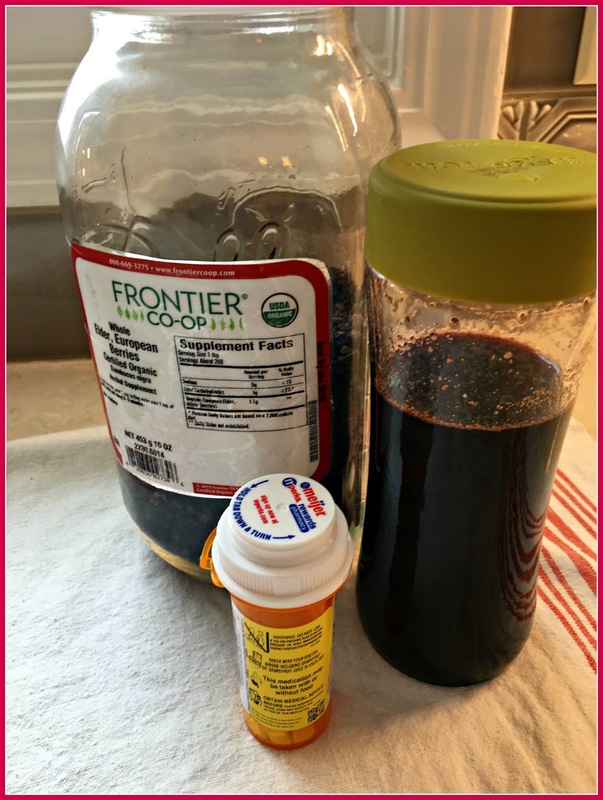 But I'm definitely open to natural solutions, and I'm taking homemade elderberry syrup as an immune booster. I'm looking into scheduling a breast thermography instead of a mammogram this time around. I try to read various sources of news, and think as carefully as I can about the issues. I'm trying to limit my social media because frankly I need to sleep. Oh, it's a crazy world. I really wish it could just be tea parties and loveliness all the time, don't you? Deb, you are precious beyond compare. I know we agree on SO much. This is what I do: I steer clear of FB and extreme liberals. And I look to God, knowing Who Wins in the End (God Does) and that it is not my fight, but His. I pray for Peace as Jesus wished for us all - and then go lose myself in a cup of tea dn some prayer. And after that I grab a favorite tea magazine or tea book or read tea-related blogs while sipping and find myself with the peace I need to ward off the nerves about this big nasty ole world. Listen to your inner voice and still yourself, and know your faith will save you. Now this is one "prescription" I will gladly take. Thank you, dear friend. Hi, My older sis and I often have this conversation. We do not know whether to have the mammogram or not, the flu shot or not. As for political, I steer clear of it and just pray for our leaders to have wisdom and to do the Lord's will. Deborah, yes please tea parties and loveliness all the time! It is quite depressing to read the headlines now. I would love for you to come and join me anytime at the Home Sweet Home party again. I am still having tea and recipes but, God has called me to discuss a few things now so my blog is centered around the bible. I always loved visiting you for tea. Michele is right the shield of faith is in dire need now. Ephesians 6:16 "In all circumstances take up the shield of faith, with which you can extinguish all the flaming darts of the evil one." We'll get through it always staring straight ahead at Jesus. So good to see your comment today. Take care. Tea parties and loveliness sound wonderful! Yes, it's a crazy world. In the end, God will have the final say. Even when it looks as though things are out of control; He is the One who is in control of it all. We can take comfort in that. I agree with you on so many levels, Deborah, and I am horrified at the way people are talking about your new President. Being a Canadian, I think they should give the man a chance before writing him off completely. And I was simply heart-sick to see that some have even taken pot-shots at the little ten year old boy. How cruel! He doesn't deserve that. I had flu shots for years because of my chronic illness but the past three years I have been using Cold FX instead and they help me as much if not more than a flu shot. They are expensive but at least I know what I'm putting into my body. I have a mammogram every two years. My best friend died from breast cancer and I had a scare myself twelve years ago so as much as I hate going for it, the mammogram is something I do. Thank you for another thought provoking post and I hope your February is lovely as you are, dear friend. Women think a lot, don't we? So much to consider. I try to educate myself by reading everything I can and then, once my mind is settled, I am pretty "black and white." Thank you for the discussion! All the best with coming in for a landing on the important things regarding health, etc. Being kind and reasoned and fair...that's perfectly said. And as far as our health, we need to use common sense and also pay attention to our own bodies and do what we feel is best. There's not just one way to eat, exercise, rest, etc. Everyone is different! What works for one person might not for another. Shish...I could really get going on this one! lol Hugs! I have a flu jab as I need to keep healthy to care for my husband and parents. I also have a mammogram for the same reason. I always question medication that is prescribed and look for an alternative but then bow to superior knowledge. I pray daily for World peace and hope all the hatred will stop. Tea right now sounds nice. I know how you feel, Deborah. Have you ever heard of the wise man's curse? "May you live in interesting times." We are living in interesting times, and my head is spinning. I'm a political junkie, so I can't not pay attention. I don't get flu shots, but I do get mammograms. My cholesterol is almost too low, which makes my doctors happy. And....I don't know what I would do without my afternoon cup of tea. The world is a better place after that cup of tea, just as my grandmother always said. Times like these make me even more appreciative of friends and family we can have spirited debates about religion, politics, and sports without losing each other as friends. We've always appreciated being able to disagree with people respectfully, giving them the chance to explain why they hold a differing opinion and hopefully they do the same with us. Being respectful and kind isn't all that hard, it just means thinking abut and considering others.It is distressing to see so many on social media being hateful and violent to those who don't share their opinions. Yes, tea parties and loveliness are very appealing. Oh, Deborah! I really know what you're saying. . .it was distressing me to see people I love and care about becoming so nasty on Facebook. So, I decided to temporarily block them so their misinformed comments don't show up in my feed. And I have been following some fun, creative people, so now that's all I'm reading. After the inauguration, I made a comment on how beautiful and elegant the new First Lady looked, and I was stunned that some of my family were extremely negative about that. Anyway, getting the flu shot has helped me, and really, I think the mammogram is extremely important. My neighbor is alive today because the aggressive form of cancer she had would have been undetected until too late if she had not had the test done. Oh Deborah, I can so relate to you on this issue. My late Beloved was a pretty much black and white person, but me....I'm like you. Sometimes I feel so wishy-washy, too, but maybe it's because we do see both sides on many issues. I do get a mammogram every year, but as for a colonoscopy, I've never scheduled one! I hope the elderberry syrup helps your immune system. My apple cider vinegar/honey drink seems to help mine! Aren't we a funny lot??!! Love and hugs to you, dear Deborah. Like Cynthia ^, I have had to unfollow many friends AND family. I don't take flu shots, but my husband does. I have a sister with a chronic illness much like GBS that is purportedly linked to the vaccine, but it's not B&W either. I do mammograms, and had a sister who was dx'd with BC at almost 70 from her routine test. Gathering info for informed decisions is good, taking tea and praying on it all is even better. I found your post today oddly reassuring even though your ideas might seem anything but. I agree with you wholeheartedly and see so many shades of grey that I find myself wishing for the simplicity of my youth, when I saw all things clearly, in black and white. You know back when we thought we knew it all and had it all figured out,hahahahaha! Turning sixty one soon and I can tell you that the older I get the less I am sure of except for one thing, God is in control and I simply need to let it go. My favorite new mantra, Let Go, Let God. I will also say that all the divisions I see on social media are heartbreaking and I have found I need to unplug and pray. Thank you for sharing your thoughts today! Hmm, not a lot to add that hasn't already been said other than to say I'm mostly a 'black and white' thinking person. I tried a pill under the tongue flu prevention from the health store one year but haven't done anything since. I'm retired and not amongst people like I was when working and use hand sanitizer regularly, especially at church when ushering. Therefore, I'm hoping I'm not as susceptible because I'm not out and about as much. We have a provincial plan from which I receive a letter every 2 years to go for a mammogram but once we're 70, that will terminate. With colon cancer in two past paternal generations, I have a colonoscopy every 5 years and do both of these exams faithfully. One does the research and then makes a decision; I like the naturopathic route of using herbs and combinations of whole foods for my health. I'm on the outer edge of politics as it's not an interest of mine but can say this is one aspect where I have some grey areas, especially regarding the US. What a thought-full post and I appreciated all you had to say. It does seem there are so many choices and decisions to make. In the end I go with my "gut" a lot, what makes sense. But always a wee bit of doubt. But don't like living with that so boldly stand with my decision. There are so many viewpoints now to read, which may be a good reason to stay off of social media and have that cup of tea and be still! We think so much alike. I, too, find it hard to deal in black and white--the rights and wrongs of it all. Who is right? Who is wrong? Is there a common ground we can agree on? I have been researching and studying herbs and oils for well over a year (and have the notebooks to prove it-lol). My grandmother was an herablist that raised all her own herbs in a little patch out behind our house. She always wore an apron -right up to the day she died- and there was always something herb-ish in those pockets. I don't think I ever took any meds from a doctor until after I was grown and left home. She was our 'medicine man'. It is amazing to me what I have found out this last year and I hope (and pray) that I will be able to help/share this knowledge with others in the future...I don't think we are ever too old to learn.....NOW--if I could just discover the secret to the fountain of youth we would be all set! I remember when the great world of the Internet first began and I was told that it would be the "age of information." Well, information we have a-plenty, almost far too much, at times. It's hard to sift through it all and make informed decisions. One study says one thing, another says something opposite. I stretch my mammograms out to about 3 years, too, and other medical tests. I'm black and white about my faith in Christ, but there are many, many grey areas, even in matters of faith and biblical interpretation. I'm so glad that our God is gracious to all and that we, of finite understanding, are so loved and accepted by Him. Thank you for a lovely, thoughtful post. As for flu shots, since I've been paralyzed due to a rare auto immune disease where the body attacks itself, I have been prescribed the flu shot annually and every 5 years a shot for pneumonia. The last 2 years I've gotten the flu, this year with a lingering bronchitis so one often wonders... Due to my CKD I cannot take any over the counter meds so it's only due to eating healthy with lots of fresh fruits and veggies that I maintain the balance. Very proud though that in the end of October my blood work was excellent and so was Pieter's. Well, he too benefits from a healthy diet for keeping blood pressure and cholesterol etc. in check. Pieter is also taking statins and I had a discussion with our doctor because I'm very worried after reading that they affect mood and cause memory loss... Who wants that?! But we got the reply that Pieter since his open heart surgery has been placed on statins for life. That sounded like a 'death penalty'... sort of. What can we argue with? He explained that if he would not prescribe them, the insurance companies would raise hell! There is also a lot of profit in those statins but here again, WHO can see through it all? We rely on information and at times you are far better off by NOT reading all the information out there and instead going to bed by 9:00 PM and have a restful and peaceful sleep, while the world with its politics and hatefulness goes on. Indeed, the core issues are our Faith, our Family and Love for each other and more than other times we ought to adhere to that. I turn it over to our Creator for being the Final Judge for so many things. We cannot break our minds over all the 'macro' management of family (yes there can be some very toxic ones too), friends (again some that turn toxic...) and the rest of the world with so many opinions and even more divided opinions from the Godless bunch. It is wise and far healthier for distancing ourselves from them and living as good as we can, being kind and polite, courteous to those that are most deserving and letting the rest be. Also I do believe in the Power of Prayer and above all for our world leaders. The problem from present times is above all the Greed and with that they push so much of high moral values to the side. I don't agree with that but we can only live our own lives as a good example and that's it! Hi Deborah, your post brings to light so many of the thoughts and questions we all have. I have never had a flu shot in my entire life. I'm allergic to so many things that my doctor thinks it better to pass on it. I do however get a mammogram each June in the new 3D profile. It does give me some peace of mind from year to year! In all other areas, I have my opinions but choose to stay neutral and just pray for those that seem to see life as an entitlement. I turn to God for all things and leave my troubles at HIS feet. There are many things that I can only think in Black and White about and that is my faith and caring enough to do the right things. It's the grey areas that I ask for help and give up to praying. In the end, I try and follow my heart and gut feeling about decisions along with asking God for direction. It has not failed me yet. You asked about the windows and any thoughts. I'd say, get lots of quotes with presentations and customer reviews. There is a lot of frauds out there and windows need to be installed right and pass inspection with a lifetime warranty!! Although I have strong opinions on some issues, I am sometimes swayed by what others think. I agree; the current political situation is stressful. I've never seen anything like it. I used to take statins, and I was pleased when my doctor took me off them and prescribed another medication for high cholesterol. There may be something else you can try. You can ask. Sometimes I take the flu shot and sometimes not. It depends on what's going around and how my health care giver advocates and approaches it. I always get a mammogram... every year without fail. I have had some scares, and I have lost some friends to breast cancer. Again, talk to your physician about matters that concern you. He/she should be able to give you comprehensive information to set your mind at ease, or to choose another option. Such wise words, my dear! I am with you 100%. Truly, there is no single right way to live this Christian life of ours. What one person is led to do isn't always what God has for someone else, and we are in dangerous waters when we begin to think "our way" is the best way. My soapbox saying in life has become "different doesn't mean wrong." Just because someone does something differently than I do, it doesn't mean either of us is doing something wrong. Case in point, the flu shot---I don't do them, but many friends do. As long as we allow one another freedom and don't try to force them over to our way of thinking, we can live in peace about this. But when one camp or the other tries to "convert" the other, that's when the trouble begins. Hi Deborah...yes, we do live in a difficult time with so many choices about so many things. I went for years without taking the flu shot...I literally refused every time it was offered at work because the one and only time I had taken, I swear I got sick...and I am rarely sick! Well, now I have no choice in the matter if I want to keep my job...it's mandatory for anyone working in health care. Since my mom and sister along with other family members have had breast cancer, I am at high risk so I do have my mammo yearly...plus they are free, also part of my insurance. I have taken Red Yeast Rice instead of and statins. It seems to do well for me keeping my cholesterol in check. As far as the political issues...they are mostly black and white and when it comes to our new president, I have to continue to give grace. Throughout history, especially in biblical times, God put quite a few flawed men in leadership because He knew what the outcome would be. That is what my prayer is happening now. Like you, I have lost sleep over this...maybe because I watch Fox News before I go to bed...lol! This was a great, thought-provoking post! Feeling all the same feels as you. I try to be a balanced and sane person. I want to be informed and educated but at the same time I need a semblance of peace and calm in my day. I find myself seeking facts without opinions, and they are few and far between. I crave a rational conversation without extremes on one side or the other. And it hurts me deeply to see people I care about and respect being so uncivil to each other. Regarding health, I get a flu shot most years because I work in an elementary school. One year I skipped it, and got the worse flu I have ever experienced. I have gotten 2 mammograms, one 4 years ago, and another this year. I got a scare but it was only cysts but I will now probably get it done once a year. I will be 55 this year and for the first time in my life I'm starting to notice my age. Well, I'm off to watch the Super Bowl. We have a big spread and all the family is home - oh, and our team is playing! Of course that's also divisive. Since I'm an Air Force mom, I have friends all over the country and if they aren't a Pats fan, they hate us! But at least that is all in fun (most of the time). Hi Deborah, I agree with you in so much of your concerns. I do get a 3D mammogram each year, this year we skipped the flu shot. My daughter and sister are both nurses in a hospital and they said that the flu shot is not good this year. They have to get it because they are health care workers, but I have information that many people are becoming ill because of it. I used to take statins until I read how bad they are for you. They cause a multiple of health problems. I tried at least seven different ones, but after about 3 weeks, I started to feel like I had flu, heavy legs, and all around fatigue. Social media is a mess and I try not to spend too much time because it upsets me. I am learning to give it up to Jesus and let Him take care of the craziness. Wonderful post! I'm very opinionated but am able to listen, usually, to the other side...as long as the person is respectful and kind. If they aren't, I classify them as ejits and buffoons and turn the other cheek. No, not really, I just go the other way. (might as well be truthful, eh?) Admittedly, I am fed up with the whiners and cry babies. What happened to adults being grown-up about any and all situations? Shades of gray...I'm black and white when it comes to Jesus and His salvation. He's the only way to heaven no matter what some say or believe. As to health...last time I went to a doctor, July 2012, he tried to put me on pills because I admitted I was depressed over Dave's death. I refused and he said, "Oh, it's not that much, it's only ____ and I take them." Ah well then. I just don't go to doctors; they want to find something wrong so they can pump money into their system...ugly way of looking at it but there's a modicum of truth there. On everything you've said, there's a flip side that's not so good...mammograms can cause cancer, statin's have 2 or 3 sheets of side effects, as to flu shots...no thank you! Gosh. Are you sorry I stopped by?